“The X-Files” at The Paley Center for Media on October 12, 2013. FOX’s “The X-Files” tapped into a new age of anxiety when the series immersed us in a mesmeric universe haunted by uncertainty, fear, and distrust, and presented two of television’s most complex and enduring characters — FBI agents Fox Mulder (David Duchovny) and Dana Scully (Gillian Anderson) — to navigate us through it. 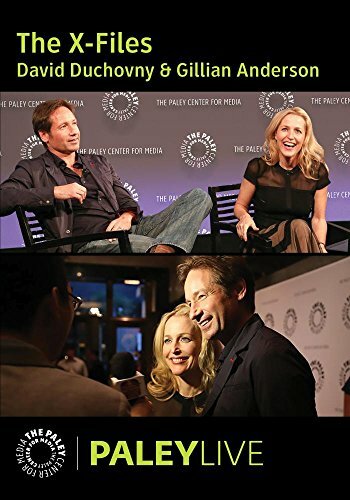 This PALEYLIVE event celebrates the twentieth anniversary of “The X-Files,” a series of science fiction dramas about FBI agents Mulder and Scully and their investigations into “unsolvable” cases involving paranormal phenomena. Keith Uhlich (staff writer, Time Out New York) moderates the following panelists: cast members David Duchovny (“Fox Mulder”) and Gillian Anderson (“Dana Scully”). The panelists touch on such topics as: the improvised nature of the show’s “mythology”; the unique directorial and creative style of the show’s creator, Chris Carter; and recollections of working on the two “X-Files” theatrical films. Questions from the audience then lead to a discussion of the following topics among others: the level of intimacy between the two leads; why producers decided to end the series; and how Anderson’s character was an inspiration for women going into scientific fields.